MAJURO, Marshall Islands – (AFP) – Conservationists have attributed a dwindling demand for shark fins to China’s crackdown on corruption which has forced a decline in lavish banquets. “We are seeing a reduction in demand from China. Hong Kong is also showing a significant decline in consumption,” Angelo Villagomez, a shark specialist with US-based conservation group the Pew Charitable Trusts, said Sunday. Villagomez was in the Marshall Islands to discuss shark sanctuaries with leaders at the Pacific Islands Forum, the annual summit of Pacific heads of state. However, he said the decline in shark fin demand over the past year was not directly linked to increasing shark protection by Pacific island governments. Instead, it was related to the Chinese leadership’s crackdown on graft and opposition to extravagance. “It’s not to do with conservation. It’s related to a Chinese government anti-graft crackdown, which has cut back on dinners where shark fin soup was featured on the menu,” Villagomez said. Historically, high demand in the Asian market has fuelled shark-finning by fishermen on commercial tuna vessels in the Pacific. But finning is slowly being shut down as the number of islands legislating shark sanctuaries grows. Villagomez will be meeting this week with Pacific leaders to discuss extending the number of shark sanctuaries. “The Pacific is leading the world in shark conservation,” he said. 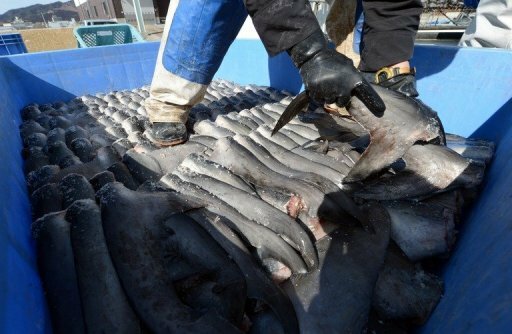 The nearly 300 purse seine fishing boats now plying tuna grounds in the Pacific are required to have independent observers on board and with “100 percent observer coverage, enforcement of shark bans is as good as it will get,” Villagomez added. Since banning shark fishing in its waters in 2011, the Marshall Islands has arrested two foreign vessels for having shark fins on board and fined them more than $100,000. “During the next two years, our goal is to create a united Pacific front on sharks,” Villagomez said.